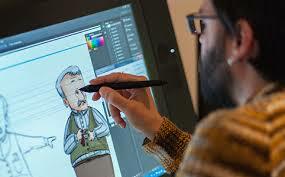 1 The aim of this course is to understand the fundamental properties of animation. 2 Engaging in various techniques and exercises to comprehend the technical and aesthetic principles of this profession. 3 Individual exploration and creativity is emphasized through visualization of stories and sequences for film and animation production. 4 Specifically build student’s ability to communicate and visualize various academic aspects of animation, film storytelling, 2D and 3D character modeling while benefitting from continuous engagement of advanced digital equipment and software. 1 Course objectives are to achieve proficiency in necessary practices of the field. 2 Reach a level of understanding of the professional process, methods and inspirations as individual artists. 3 Expand student’s conceptual and technical knowledge through theoretical lectures, projects, group presentations and critiques, class discussions and individual consultation. 4 Emancipate student’s artistic abilities, analytical skills and visual language.